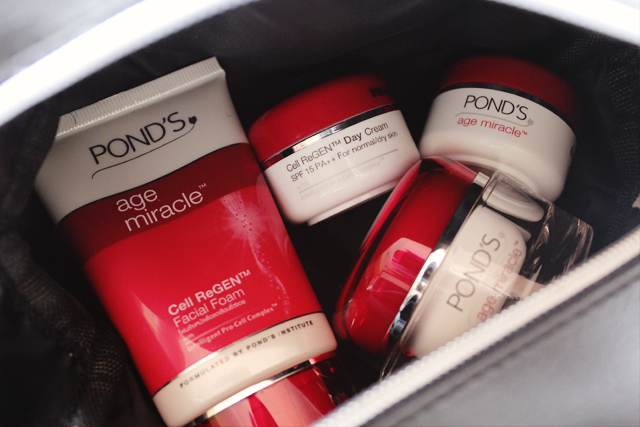 Since 1846, Pond's has been making a difference to women's skin and their lives through revolutionary product creations. Passed on from one generation of women to the next, the brand strives to be a true reflection of the modern woman who radiates with confidence and happiness. The brand recognizes that the secret to youthful skin lies within the stem cells, which are responsible for cellular renewal and young cell regeneration. Hence, Pond's concocted a potent combination of 6 Youth Enhancing Bio-Actives - two Retinol boosters, AHA, Glycerin, CLA and Retinol - that works to correct expressions lines by 27%, repair the skin, enhance collagen and new cells production, and boost skin's moisture from within. Earlier this month, Pond's announced multi-talented award-winning local artiste, Michelle Chong, as the latest ambassador for this new anti-ageing range - Age Miracle. Ever ready to express herself through different roles – actress, director, host and writer, Michelle Chong embodies the confident and driven woman that Pond's aims to reach out to. This is made up of 2 creams - pink and white. The former is enriched will cell-boosting collagen that helps to reduce the appearance of fine lines, wrinkles and crow's feet around the upper eyes, for a smooth and lifted look. The latter is powered by anti-aging active, CLA, to stimulate blood circulation of tired-looking and puffy skin under the eyes for an instantly brightened look. Containing the five actives - CLA, AHA Retinol, Glycerine and 2 Retinol boosters, this velvety, luxurious cream renews skin fast and intelligently targets wrinkles, fine lines and age spots, resulting in an exceptionally smooth and bouncy skin. Designed to intensely accelerate the renewal process at night, when cells' regeneration potential is at its peak, this rich creamy texture melts into the heart of the skin – revealing skin that is silky smooth and luxuriously soft the next day.